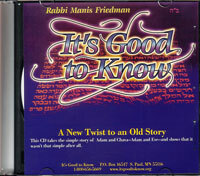 In this AUDIO recording by Rabbi Manis Friedman, we find that the “simple” story of Adam and Hava (Eve) wasn’t all that simple after all. What was she thinking? Everything happens by Divine Providence, and ultimately for the best, as explained in the deeper message which the Torah teaches about Hava, the mother of all people.